Everest Base Camp trek basically designed for those trekkers who want to spend a day in a lap of the World’s Tallest Mountain. The whole trek is covered around 14 days for those trekkers having sound health and good physical condition. 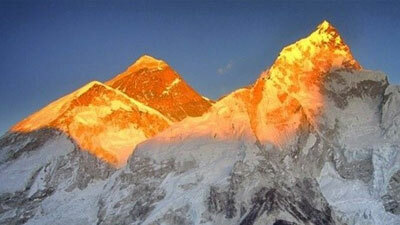 The Top of the World: Mount Everest (8848 m), fascinates trekkers worldwide with its awe inspiring charm. 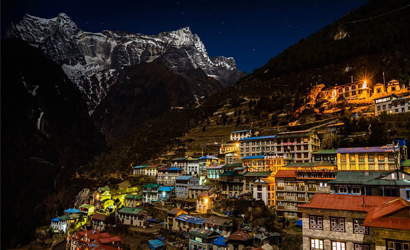 This Everest Base Camp Trek takes us through the backyard of the world famous Sherpas, exposes us to the beauty of Namche Bazaar, Sagarmatha National Park, the spectacular Kala Pathar – the best viewpoint of Mt. Everest - and Everest Base Camp itself. Along the way we experience the unique culture of Nepal as we pass through Sherpa villages, walk under colorful prayer flags and weave around Buddhist stupas. 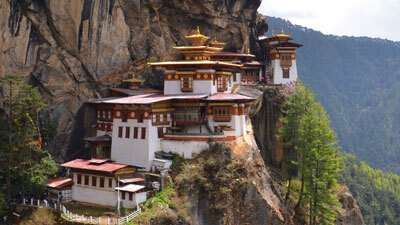 Beginning in lower elevation, you will see many stunning Himalayan Peaks. As you climb higher, magnificent views of Mt. Everest (8848 m), Mt. Lhotse (8516 m), Mt. Makalu (8481 m), and Cho-Oyu (8201 m) will come into view. Trekking to Everest Base Camp is the adventure of a lifetime. Miles away from the busy lifestyle of cars, conveniences, and daily luxuries, you will saturate your spirit in natural beauty and stretch your personal endurance beyond what you thought was possible. See more. 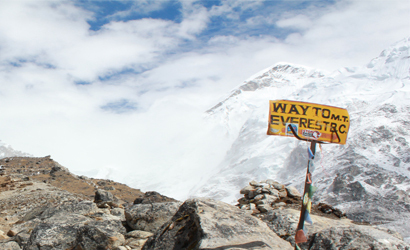 Everest Base Camp trek is designed for those trekkers who want to spend a day in the lap of the World’s Tallest Mountain. 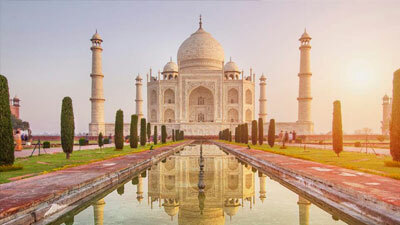 Round trip, the trek takes 14 days for those trekkers who are in good physical health, have normal hiking/trekking experience and who can walk up to 6-7 hours per day without any difficulties. Laying the foundation for our trek, trekkers/hikers fly from Kathmandu to Lukla (2827 m) on the most scenic and the most challenging flight you may ever take. After landing up in Lukla airport, you will be introduced to our porter (We will hire guide in Kathmandu only) and then commence trekking to Phakding. The next day, you will ascend through the Dudh Koshi valley to the Sherpa Settlement of Namche Bazaar, an official capital of Sherpas. This is a small town in the east part of Everest region where you can enjoy the local food, culture & tradition of Sherpa community people. The town is also popular for Yak cheese. In this town, we will stay one night to give a proper acclimatization to our body since many of trekkers suffer from heath issues related to high altitude. Our trail then respectively ascends to Tyangboche, walking through a lovely forest of rhododendrons and then to Dingboche. Enroute, you will be rewarded with the views of Everest soaring behind Nuptse, Lhotse, Ama-Dablam, Kangtega and Tawache peaks. Our second rest day will be in Dingboche, where we will take a short hike up to Chukung and then descend down to Dingboche for an overnight stay. After, crossing over the suspension bridge and passing through Lobuche, several Buddhist monasteries and Sherpa villages, you will finally reach Base Camp. You can spend a night at the camp in a tent or continue your trek towards Gorakshep. As you climb towards higher altitude, you will feel that the air is getting thinner and thinner. 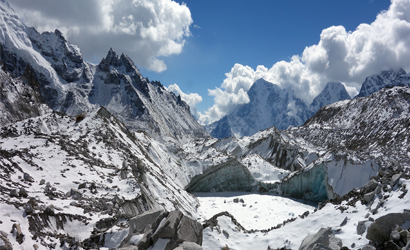 The trail then descends from Kala Patthar to Pheriche. From Pheriche, you will retrace your footsteps back to Namche Bazaar, Phakding and finally to Lukla. You will spend one more night in Lukla before flying back to Kathmandu the next day. Day 1: Arrival in Kathmandu. Transfer to Hotel. Early morning 45 min short flight to Lukla will make your day .After arrival you will have a time to rejuvenate for short time and then trek starts to the trail of Phakding (2652). The trail contour through the Sherpa village and yak pasture land. Have a lunch in Thado Koshi (2591m) with stunning view of Kum Kanguru (6370m). You will see the painted Mani wall in Ghat (chhuthawa) village. In the late afternoon you arrive to Phakding. Your trekking starts after breakfast. You cross long suspension bridge over the Dhudh Koshi River which is originated from Khumbu glacier. Today you will enter the Sagarmatha National Park in Monjo village. You have lunch in Jorsale (2740m).The trail goes ahead along the Dudh Koshi river. After half an hour steep walk you will see Mt Everest (8848m). The trail ascends until Namche Bazaar through the alpine forest. .
Rest day in Namche Bazaar is especially for acclimatization with altitude. During this day you can walk around Namche Bazaar. Here you can get many facilities such as bank, internet, Bakery and shopping. After the breakfast One and half hour steep walk to Syangboche (3880m).will lead us to the panoramic view of Himalaya’s i.e. Mt. Everest(8848m), Lhotse(8516m), Ama Dablam(6814m), Thamserku (6618m) and more mountains. After lunch in Khumjung village (3780m) hike back to the Namche Bazaar. Today’s trek makes you be there and feel close to Himalayas with tremendous view of Thamserku (6618m), Ama Dablam (6814m), Mount Everest (8848) and other world high mountains. 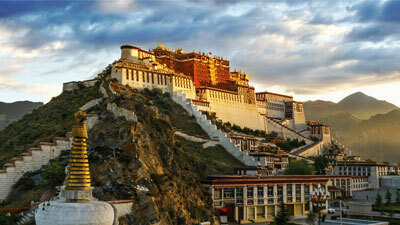 You will get to experience the vision of national bird and Himalayan Thar which are only in Himalayas. From Kyangjuma the trail goes down to Dudh Koshi. With long suspension bridge crossing will lead us to Tengboche (3860m) with almost 2 and half hour trek. Day 7: Tengboche to Dingboche (4260m). Form Tengboche trail move down towards Deboche (3820m).After Deboche, the trail becomes very pleasant and comfortable and possibilities to see and endangered Musk deer. After crossing Iron Bridge on your right side you can see the great view of Ama Dablam (6814m). Then the trail moves gradually up to Pangboche (4410m). After the lunch in Shomare (4110m) you walk around two hour and arrive to Dingboche Village (4410m). Day 8: Rest Day for Acclimatization at Dingboche (4730 m). 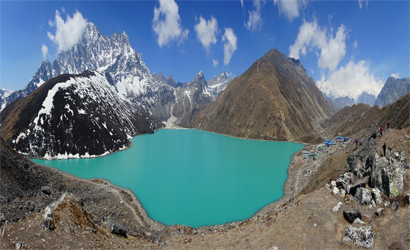 It is the best place to acclimatize for mountaineer thinking of conquering Everest or trek to Everest base camp. The Chukhung village has several Yak herders, hunts and few tea houses. From Chukhum great view of the Karyolung, Numbur and Khagtega mountains. Day 9: Dingboche to Lobuche (4930 m). Form Dingboche the trail climb up 20m above the village. 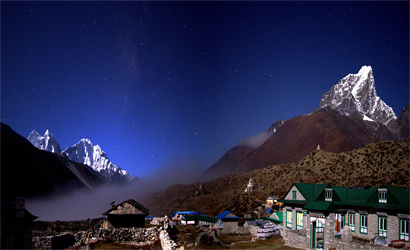 From here you can see panoramic view of Khumbu Mountains including Mt, Makalu (8463m). Tea break in Dughla(4620m). After Dughla you ascend along with pebbly and sandy trail. After half an hour climb you arrive to Dughla Pass (4830m). In Dughla pass you see monuments on the memory of Everest climbers who has lost their life while climbing Mt. Everest. From here trail goes gradually up to the Lobuche (4910m) with Evening sunset view of the Nuptse (7864m). Day 10: Lobuche to Gorkhashep (5140m) - Everest base camp (5364m). Return back to the Gorkhashep. This morning you might feel chilly because temperature may go down -2 to 3 degree Celsius. In the beginning you walk along the flat trial through yak pasture trail (50 minutes). Then you have to walk in glacier. The trail is rough and icy in some part. And you arrive to Gorkhashep (5140m). At this time the temperature is nearly 10 to 15 degree Celsius. You might feel fatigue. Have lunch and rest in Gorak Shep. After light lunch start to hike to the Everest base camp (5364m). After a while return back to Gorak Shep. 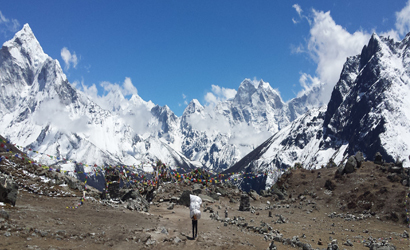 Enjoy the view of Khumbu glacier and foot of world highest mountain. Day 11: Gorkhashep to Kalapatthar (5545m). And down to the Pheruche (4230 m). Early in the morning start climb to the Kalapatthar (5550m). Nearly two and half hour climbing, you will reach on top of the Kalapatthar. Kalapatthar is one of the prime points for the massive view of Mount Everest (8848m) with little bit strong wind. Enjoy the view of Mt. Everest and other towering mountains. After breakfast we will back to the Pheruche, same route. We retrace our steps with a Trek back to Namche about 6 hrs from Pheriche and do an overnight at the bustling & hustling village town of Namche. Day 13: Namche Bazaar to Lukla. This is our last day on these lovely mountains that have been home to us all of these days. We continue to back track our hike towards Lukla along the Dudh Koshi River which is about 7 hrs from Namche and do an overnight at Lukla. Most flights from Lukla to Kathmandu are schedule early morning to avoid the strong winds. It’s a scenic flight from Lukla to Kathmandu for about forty five minutes. We touch down at Kathmandu and transferred to our hotel.